Guess what? In between all the partying, pumpkin-carving and birthday-present buying I have been knitting! I’m working feverishly away on the cabled socks from the fall ’05 IK. I’ve only had to rip out one foot because I didn’t like the way the decreases were looking. I end up doing that at least once when I’m doing socks with the magic loop method because I always end up screwing up the decreases and having them end up in the middle of the ankle – too low is what I’m trying to say. 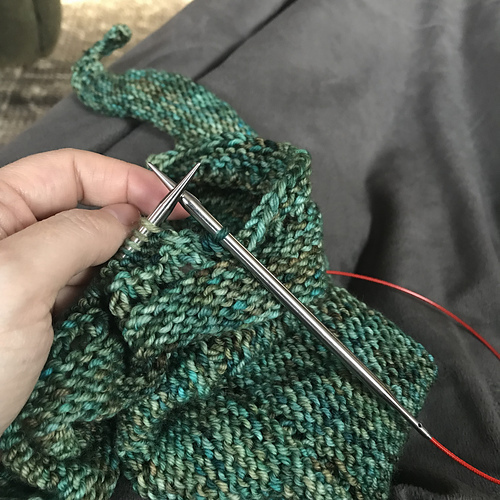 I’m doing two at a time – one is upstairs on the nightstand and the other is in my knitting bag because the easy v-neck has gotten a bit large to be toting around. Yep, that’s right, I’m working on a sweater, too! Oh, and don’t forget Madli’s Shawl which is in it’s own pretty knitting bag hanging by the kitchen door and looking at me with sad, soulful eyes whenever I pass by. (by the way, Madli? The guilt? Not workin’. I’ve lived with my mother. I am impervious to guilt. I have had so much guilt heaped upon me in my lifetime that guilt no longer effects me. At all. In any way.) (sorry mom, but you know it’s true) Anyway, where was I? Oh yeah, you probably want to see pictures, don’tcha. This is Lorna’s Laces shepherd sock in the Vera colorway. You probably want to see stitch definition too…. Pretty good, eh? 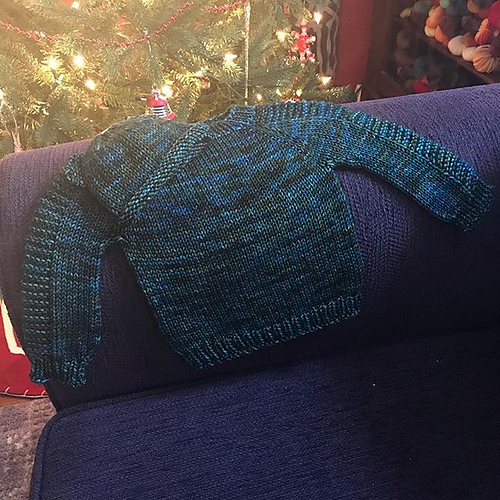 I’ve been accused of being a human knitting machine ;o) and here is my simple v-neck in Apple Hill Farm 100% wool yarn in the Larkspur colorway. It’s coming along prety well but I’ve been concentrating on the socks cuz I want them DONE!